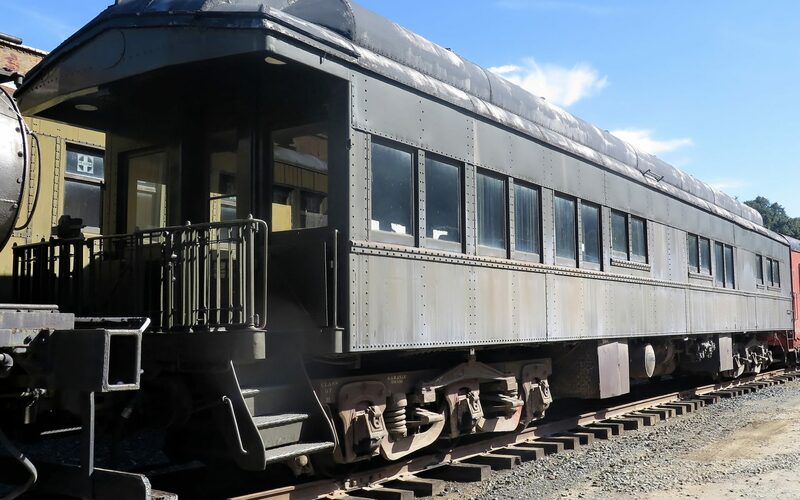 This car was built new as El Paso and Southwestern (EP&SW) coach #730 in August 1923 under Pullman lot number 4694. When the EP&SW was purchased by the Southern Pacific in 1924 this coach was assigned SP number 1057. In January of 1929, SP 1057 was rebuilt as an open-platform observation business car and renumbered/named Southern Pacific Railroad (SP) #139, “Sacramento”. The SP139 was the business car for the Superintendent of the Sacramento Division on the SP. During 1952 M. L. Jennings was superintendent of the Sacramento Division. When the City of San Francisco was stranded in the snow in the Sierra Nevada’s on January 13, 1952, the Sacramento served as SP’s base of operations for the rescue efforts to free the train. You can learn more about the rescue of the City of San Francisco in the web links on the right side of this page. At an unknown time the car was released for use by maintenance of way and renumbered Southern Pacific (SP) #MW 5441. Acquired by PLA, July 1975; Moved to Niles Canyon in big move of Jan 8, 2005. This car has undergone some restoration work and contains beautiful wood paneling. It is currently being used for temporary storage of material from the Cascade Club.